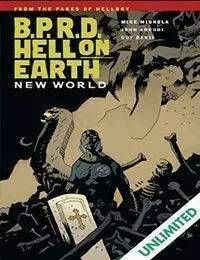 A story that began in the first issue of Hellboy concludes with the B.P.R.D. team set to permanently wipe out the subterranean colony of frog monsters that have been a story-driving plague. With Memnan Saa dead, agents Liz and Abe take on the powerful King of Fear,who ultimately reveals that it is, in fact, the B.P.R.D. members themselves who will lead the world to apocalypse, not the supernatural monsters, demons, or colossal squidbots.